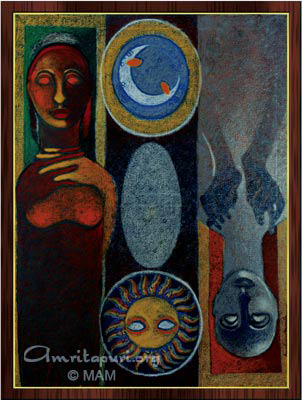 On 15 May, 2003, renowned Kerala painter Sri. Punchithaya formally started off Colours of Compassion, an Ashram project to collect paintings inspired by Amma’s life, mission and teachings from artists throughout India and the world. 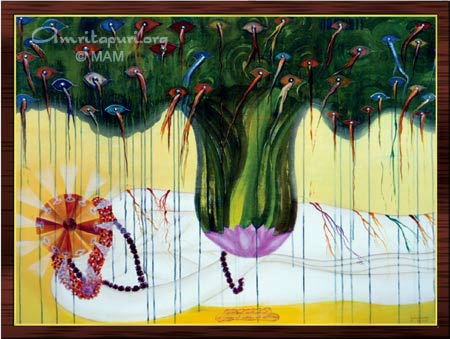 The idea was to display these paintings in a gallery during the Amritavarsham50 Celebrations in Cochin. After receiving Amma’s blessing, Sri. 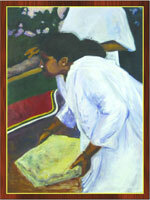 Punchithaya began the first Colours of Compassion painting not 10 feet from where Amma was giving darshan. It was a fitting beginning to a project aimed at bringing Amma’s light and love to devotees, artists and art-lovers the world over. 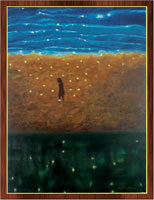 The auspicious beginning soon blossomed into one of the most extraordinary collections of modern spiritual art. The paintings were as diverse as the artists who painted them. Some came from traditional schools, others avant-garde, some realistic, some impressionistic. 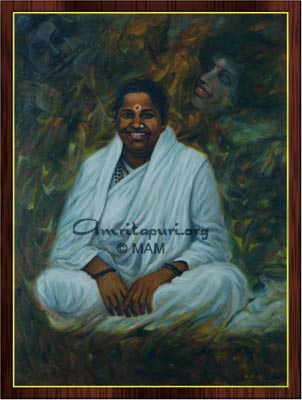 Some presented events from Amma’s life in oil, others abstract impressions—like Shri. 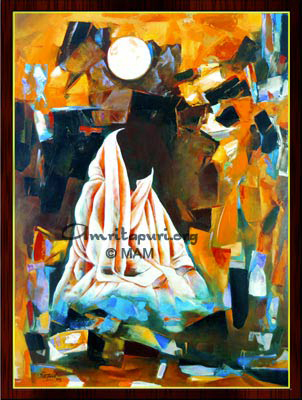 Ajaya Kumar’s acrylic rendering of Amma adrift in a see of consciousness. There was even one portrait of Amma done in stunning 24-karat gold leaf. Some of the artists were already devotees of Amma, but most were moved to participate—donating their talent and time—simply upon hearing about Amma’s life of love, compassion and service to suffering humanity. 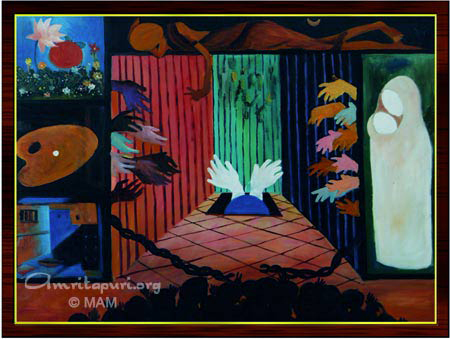 The artists selected from four themes: events from Amma’s life and mission, Amma’s teachings, “Meditation” and “Impressions.” The gallery was arranged according to the themes of the paintings. 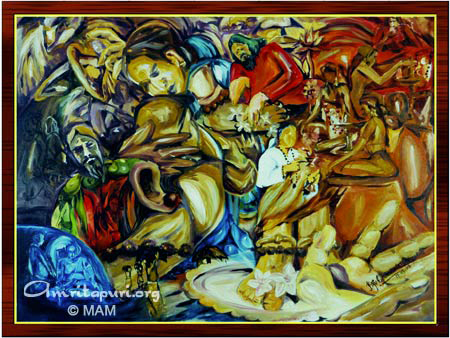 Devotees browsing the gallery saw paintings depicted Amma as Shiva, as Krishna, as Durga and as a Mother holding Her children. 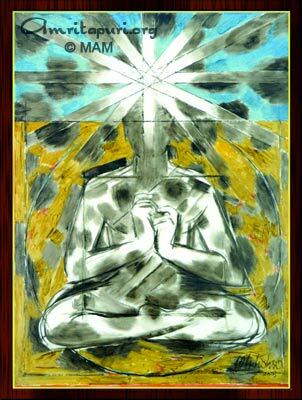 Another work depicted Amma’s mystical merging in the Divine Mother. 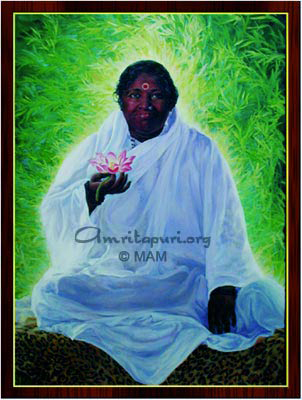 Some paintings showed Amma doing seva, for instance the one of Her carrying a large brick atop Her head. Shri. Anil V.C. 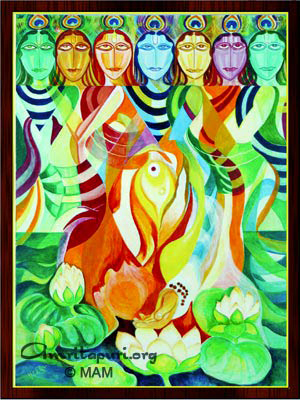 from Kottayam painted a scene from a Kerala legend wherein Devi was born as the daughter of a village chief. 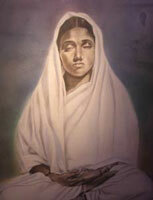 Rendered in a traditional Kerala folk style, Amma’s image in his painting seems supercharged. 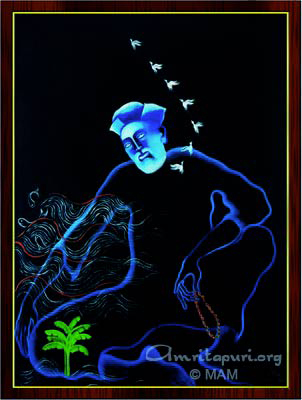 Delhi-based Shobha Broota painted an abstract rendering of Amma with blue spirals travelling downwards on a white background, representing a flow of subtle vibrations. 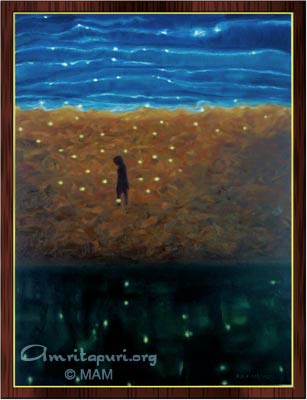 Michiko Hasegawa from Japan painted Amma meditating as a young girl. 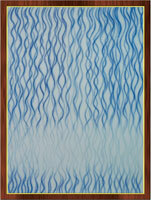 Through her soft and transparent pastels, one could see a subtle vibration and mystic flow. “As I paint Her, I am moved and healed by Her beauty,” she said. 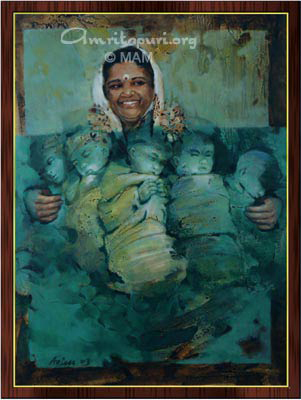 Vimal, also from Kerala, painted a mysterious piece involving different faces of Amma. In one, She smiles compassionately, in another her eyes are rolled back in meditative bliss. For many, walking though the gallery was itself a meditation, one in which they were able to experience Amma’s many-sided spiritual beauty and depth. 250-foot-long collaborative mural on theme "Love & Serve." 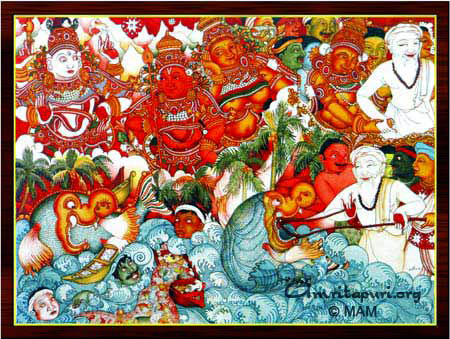 During four days of Amritavarsham50, many of these same artists joined together to create an on-the-spot painting on one 250-foot-long canvas. 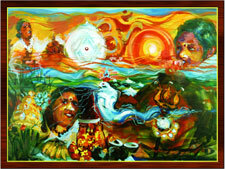 The artists all used the Amritavarsham50 motto, “Love & Serve,” as their theme. It was a particularly endearing sight to see the father-and-son team of Shri. Muralidharan and Gautam. Inspired by his artist father’s rendering, nine-year-old Gautam contributed his might to the cause—a beautiful sketch of Amma under a tree. 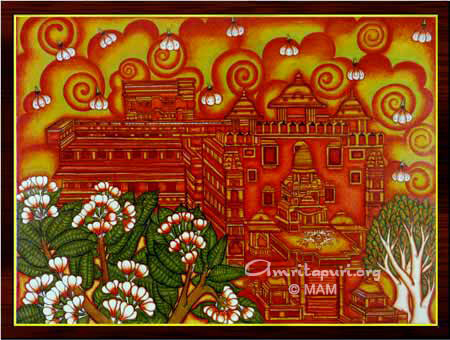 Since the beginning of history, Mahatmas have been immortalized through the beauty of painting. 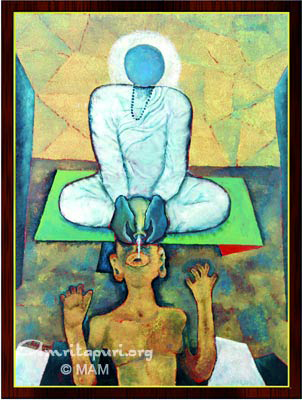 In many ways, it is through visual art that great souls such as Sri Krishna, Sri Rama, the Buddha and Christ have remained so powerfully in the psyche of humankind. Imagine our concept of Christ without the paintings of di Vinci? Has not the world’s concept of Krishna been greatly influenced by the folk paintings of Rajasthan? Perhaps the Colours of Compassion exhibit is the harbinger of a similar tradition for Amma. One’s relationship with their Guru or God cannot be properly expressed in words. Regardless of how eloquent someone may be, words can simply never fully capture Amma’s impact in Her children’s lives. 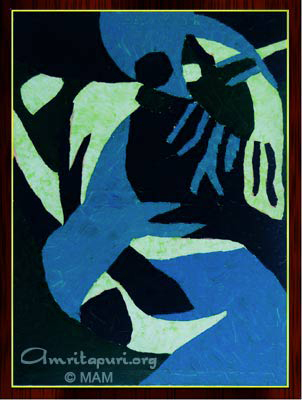 Painting, many would argue, lends itself more readily to expressing the ineffable. Certainly that seemed the case when browsing the gallery at Amritavarsham50. Now the emotions of these painters have now been immortalized and potentially can be shared with future generations. 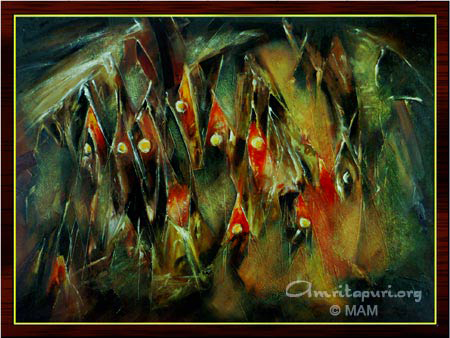 Now that the Amritavarsham50 Celebrations are over, one can still view many of the paintings at Amma’s Amritapuri Ashram, where they hang in the main temple. 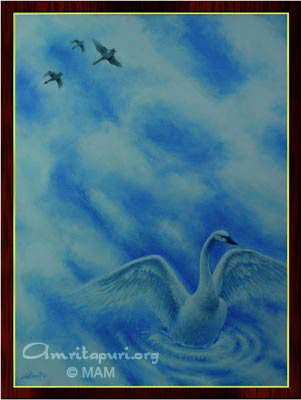 This entry was posted in Cultural, Painting, Photos. Bookmark the permalink.